It is only one-and-a-half year ago. 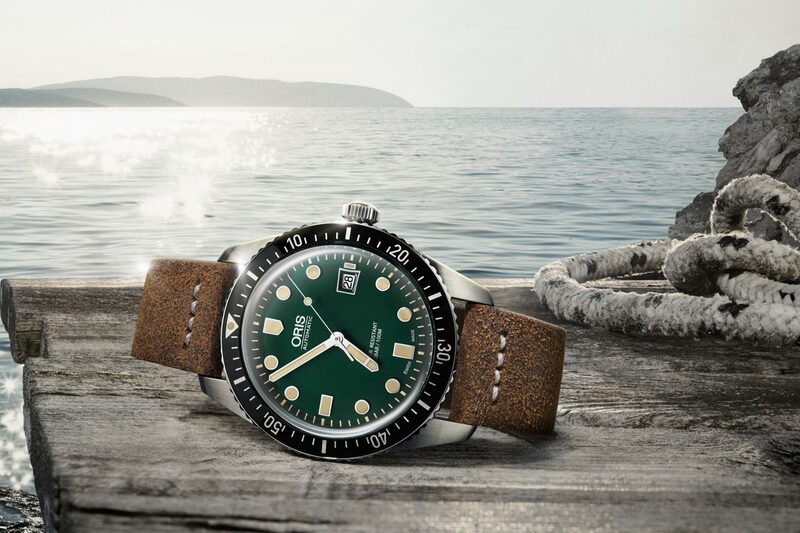 That’s when Oris introduced the Divers Sixty-Five, a new kid on the “vintage diver’s watches block”, and collectors around the world embraced this very cool, and very affordable, vintage inspired divers watch. After the first model, with similar hour markers as an old Oris from 1965, a second model with Grey and “Deauville Blue” was introduced. At Baselworld this year, cheap replica Oris watches launched the 2mm larger bronze Carl Brashear Edition and a ‘normal’ 42mm edition in stainless steel, with ‘normal’ round hour markers and a striking deep, almost electric, blue dial. Now they add a green dial, again with the same round hour markers, and in a 42mm case with domed sapphire crystal. When you read Monochrome frequently you probably noticed that we’re quite a bunch of snobs when it comes to watches, their design, heritage, build and finishing. Still, we can appreciate the occasional affordable piece, like the first Divers Sixty-Five that exact fake Oris watches launched. Both our managing editor Brice (who’s working on a proper Monochrome-style story about the new A. Lange & Söhne Saxonia Moon Phase that will be published this afternoon) and I bought the Divers Sixty-Five, and we wear it a lot. Brice shared his passion for this watch in The Collector’s Series and later we compared it to two other affordable vintage-inspired divers watches. Compared to the one that we own, this new model with a green dial, like the one introduced at Baselworld 2016, are a tad bigger and measure 42mm in diameter. The case has the same shape, the same screwed steel case back with that cool vintage Oris logo, a screw-down crown and a domed sapphire crystal with anti-reflective coating on both sides (inside and out). The water resistance is 100m and while that is not on par with professional divers watches (these usually go to 200m, 300m or more) it is certainly more than enough for the occasional plunge in the swimming pool, or for taking a shower with the watch on your wrist. So no worries. Inside ticks the tried and tested Sellita SW 200-1 that Oris actually calls the luxury replica Oris calibre 733. When you’re looking for a nice, reliable and affordable divers watch, than the Oris Divers Sixty-Five is a no brainer. 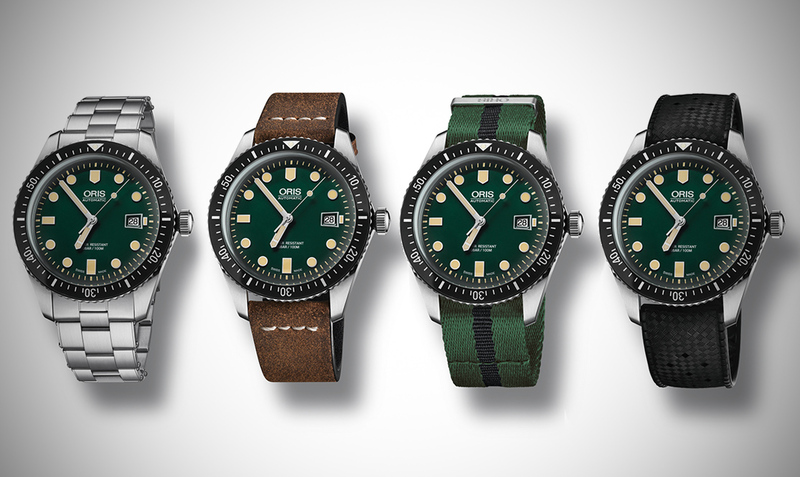 Oris offers a choice of straps and a stainless steel bracelet with folding clasp. The bracelet has this little rivets on the side and these resemble the old 1960s and 1970s bracelet that were actually riveted. Here it’s only styling and no functionality, but hey, it looks good and befits the style of the watch. With so much choice, you will have to choose how you’re going to wear the watch before purchasing. Or you could just get the Divers Sixty-Five with several of the optional straps, and get that bracelet as well. The Oris Sixty-Five with green dial is available from authorised retailers for CHF 1,900 on one of the straps, or CHF 2,100 on the steel bracelet.